With a benign blessings of their Holiness Sri Sri Bharati Theertha Maha Swamigal and Sri Sri Vidhushekhara Bharati Swamigal, the construction of Sri Sharadambal Temple and Vedapatasala at Sharada nagar, NH 47, Palakkad has commenced. The foundation stone laying for the same was carried out by the Administrator of Sringeri. Mutt and its Properties Sri V.R.Gowrishankar and our Managing Trustee Sri S.N.Varadarajan during May 2017. The land for this project to an extent of 50.5 cents was donated by our Managing Trustee Sri. S.N.Varadarajan to Sringeri Mutt during the year 2004. Now for executing this project, an additional 5.5 cents land is required which is also now being gifted by our Trust to Sringeri Mutt thus making a total extent of 56 cents of land for this project. This land donated by us to Sringeri Mutt is today worth about Rs.2 crores. 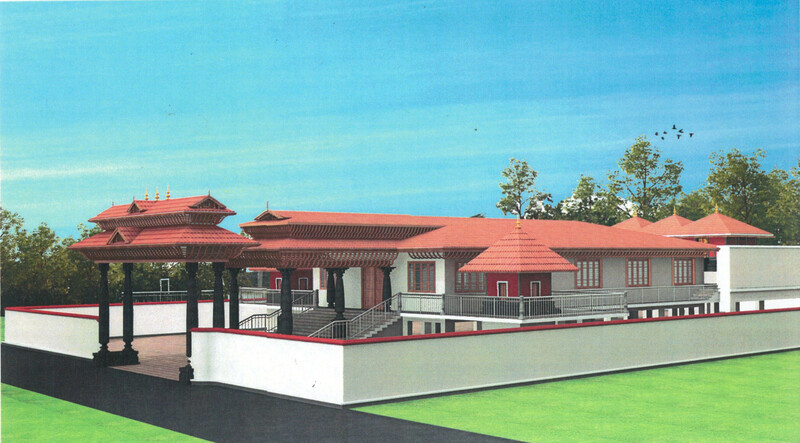 The cost estimate for the Sharadambal Temple project is Rs.4.5 crores. Towards this, our Trust has already donated to Sringeri Mutt a sum of Rs.1 crore. Public support for this noble venture of temple construction, which is ones in a life time project is solicited from all well wishers by way of contributions. The balance shortfall in the cost of construction for this project that may occur will be met by Sri Sringeri Mutt. Our aim is to complete this project before June 2019 and arrange a Kumbashishekam. Free medical camps giving medical assistance to deserving poor persons in Elappuly Village, Palakkad, Kerala were organized on 22nd / 26th / 29th of January, 2018. Free Onam food was offered to about 180 deserving poor people in Elappuly Village, Palakkad, Kerala on 13 and 14th September 2017. Under letter No: 8-2/RSKS/Acd/Misc/2009-2010/92 dated 23rd June 2011, the “Rashtriya Sanskrit Sanstan” a Deemed University under the Union Ministry of HRD, Government of India, has, through Maharshi Sandipani Rashtriya Vedavidya Pratishahan, Ujjain, M.P., which is also an autonomous organization under the Ministry of HRD has recognized our Vedic Courses and our students, on completion of respective courses will be awarded “Veda Bhushan” and “Veda Vibhushan” equivalent to 10th & 12th standards of high school curriculum respectively. The construction work of the residential quarters for teachers and other basic amenities like Kitchen, dining hall and students toilets blocks has been completed as decided by the Board of Trustees at a cost of around Rs. 40 lakhs in the Patasala premises situated at Elapully, Pallatheri, Palakkad, Kerala, India. Under our Managing Trustee Sri. S.N. Varadarajan's initiative and contributions from his family land measuring 265 cents on the main National Highway 47 in Palakkad town, Kerala, India has been purchased. The present total value of this land is about Rs. 25/- million. Out of the above land our Managing Trustee has donated an extent of 50.45 cents to Shri Sringeri Sankara Mutt, Sringeri, Karnataka, India for construction of Sri Sharadambal Temple. He has donated the balance 214 cents of land to our trust for the construction of a Kalyana Mandapam (Marriage Hall)/Old age homes which would ensure a regular income to our Patasala (Vedic School) in the years to come. These lands are in the middle of a 20 acre land being developed as housing plots in the heart of Palakkad town on the National Highway 47. The developers of the housing colony have named the entire colony as ‘ SHARADA NAGAR ' in view of our purchase. The trust is looking forward for substantial contributions from well wishers for this noble cause. In November 2003 the United Nations Educational Scientific Cultural Organization known as UNESCO made a declaration to the world on the value of the Vedic oral tradition. The tradition of Vedic chanting of India has been declared a Masterpiece of Oral and Intangible Heritage of Humanity by Unesco for being "the ultimate source of knowledge and one of the world's oldest surviving cultural traditions. In a meeting held between director-general Koichiro Matsuura and president Juan Goytisolo at Unesco headquarters in Paris on November 8, Unesco declared, "Although Vedic texts were recorded in writing 15 centuries ago, their principal means of transmission remains oral. The outstanding value lies not only in the rich content of its oral literature but also in the unique and ingenious techniques employed by the Brahmin priests in preserving the texts intact over three and half millennia. The complex recitation technique, requiring rigorous training from childhood, is based on a specific pronunciation of each letter and specific speech combinations to ensure that the sound of each word remains unchanged. Mr Matsuura added: "The Vedic heritage comprise a multitude of text and interpretations collected in four Vedas. The Rig Veda is an anthology of sacred hymns; musical arrang of hymns from the Rig Veda and other sources are found in the Sama Veda; the Yajur Veda abounds in prayers and sacrificial formulas used by priests; and the Atharva Veda, attributed to the legendary sage, Atharvan, includes hymns, charms and spells. The Veda also provide an extraordinary historical panorama of Hinduism and offer insight into the early development of several fundamental artistic and scientific notions, such as the concept of zero. Although the Vedas continue to play an important role in contemporary Indian life, this ancient oral tradition now faces many difficulties owing to current economic conditions and modernisation. Experts claims that the four noted schools of Vedic recitation may be in imminent danger of disappearing."